Millions of boys and girls enjoy the fun of playing Mini-Basketball in over 200 countries of the world. FIBA, the world governing body of Basketball, has long supported the development of the sport for children of 12 years of age and under. 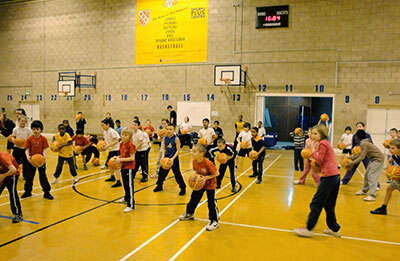 Mini-Basketball England will support any initiatives in schools or clubs to develop the game. Our mission statement – to provide opportunities for children of all abilities to enjoy quality Mini-Basketball experiences in a friendly, caring environment. provide a participation framework, which will ensure equality of opportunity for all young people of 12 years and under. encourage equality of opportunity for all to play. encourage the concept of 'Fair Play'. promote a healthy sporting lifestyle. facilitate the smooth transfer from Mini-Basketball to Basketball. The Guide describes in detail the programmes and activities to support the following guidelines. Teach basic movement skills and skills of basketball in an environment suited to children's needs and limitations. Maximise opportunities for participation for children of all levels of ability. Show that sport can be fun and for all. The right to participate in Mini-Basketball activities, games and competitions. The right to participate in activities, games and competitions at level suitable for the age and ability of the child. The right to be supervised, taught or coached by a qualified leader, teacher or coach. 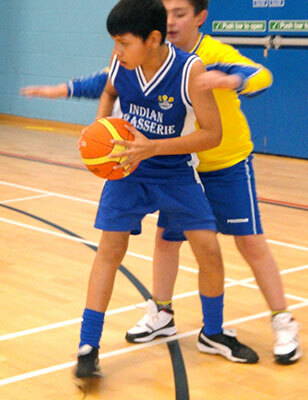 The right to take part in the making of decisions about their involvement in mini-basketball. The right to practice mini-basketball in a safe and healthy environment. The right to receive appropriate preparation in order to play mini-basketball. The right to have fun in mini-basketball. However where Mini-Basketballs are not available size 4 or 5 netballs or footballs could be used. Also general play balls can be used although they are not always appropriate for learning the specific game skills at Key Stage 2. Soft touch balls can be introduced at the early stages and for children with specific learning needs. Larger and lighter balls can be used to make catching and throwing easier for younger children. The backboard must be a flat surface. It can be rectangular or fan shaped. A small rectangle is 0.5m horizontally and 0.45m vertically. In teaching and coaching Mini-Basketball it may be necessary to use a variety of targets to improve the skill of shooting or to give alternative scoring objectives. It could be that targets above head height are marked on a wall. In some Mini-Basketball activities the objective of a game could be to pass the ball to a goal catcher who stands behind a line, in a ring marked with playground chalk or on a mat. Also the objective of the Mini-Basketball activity might be to knock over a skittle. Mini-Basketball should be played on a hard, safe, non-slip surface with no obstructions. The court can be marked on an outside playground or where possible inside a sports hall, school/community hall or gymnasium. The court as shown in the diagram is 22m x 12m but it can be scaled down in size providing the variations are in the same proportions: 20m x 11m, 18m x 10m, 16m x 9m, 14m x 8m. Other games markings can be used for Mini-Basketball activities. For example, a grid area with a number of squares or rectangles marked out on the playground area is useful for a variety of invasion games. Children find many of the adult skills of basketball impossible to reproduce. They are also not able to learn skills in full game situations. Basketball coaches may find this frustrating but children will always learn and play as children. They like to learn by trial and error in an unthreatening environment that allows them to experiment. They learn more and remain motivated when the activities are challenging, exciting and fun. A child does not pass, shoot or dribble the ball in the same way as an adult so we need to remain patient and wait until they are ready later on in their development for specific technical correction. Our approach to learning skills is through introducing carefully selected Mini-Basketball activities that are developmental and progressive rather than using isolated repetition of technical skills. It is important to stress that at the Fundamental Stage developing the Mini-Basketball ABC; Agility, Balance &Coordination is a greater priority than working on technical skill proficiency. Please note that the FUNdamental Phase – Movement Skills in the Long Term Athletic Development model includes Speed as part of the ABC's of Athleticism. Movements that help develop speed should be included in the Mini-Basketball activities. Children's skill learning is always related to their physical development and maturation. Each child should be treated as an individual. Mini-Basketball activities should allow every child to develop. Children should be taught to learn skills while developing their understanding in the context of how the skill is used in a game. Children should be encouraged to learn for themselves and understand how to solve the problems in a game. The game selected should always be appropriate for their stage of development. For example this may mean selecting an individual challenge game, a follow-my-leader activity, a chasing game or 1v1, 3v1, 2v1, 3v2, 2v2, 3v3 games. 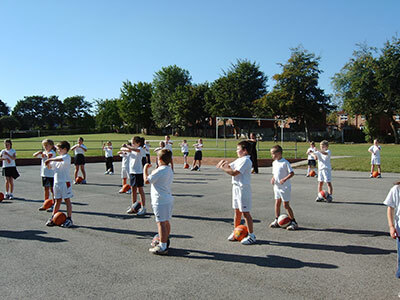 Mini-Basketball activities are selected to develop their knowledge, skill and understanding of an invasion game as part of the P.E. National Curriculum. The children should experience opportunities in the lesson to plan, perform and evaluate their performance. A player's first experience of a new game is often the deciding factor of whether they want to continue to play the game. Our aim is to ensure that players, teachers, coaches and helpers all enjoy a positive experience as they are first introduced to organised competitive mini-basketball. We also need to ensure that the players' enthusiasm continues as they go on to play basketball. The Mini-Basketball game rules are introduced as part of introducing movement skills and fundamentals of the game. They are not taught in isolation but are integral to skill learning. Competition is an intrinsic part of sport that involves measuring performance against an opponent, oneself or the environment. Competition provides stimulation and challenge as well as the opportunity to apply, test and further develop skills in a game situation. Properly managed competition should be seen as a healthy and desirable part of sport. Playing with a ball is a natural activity enjoyed by many children. Competition can be developed from play but it is not necessarily instinctive. It is more likely to be learnt in response to environmental or social factors. Cooperation is an important pre-requisite to successful competition. Competition is neither good nor bad in itself but varies according to how it is introduced, organised and treated by the organisers and participants. If children are not yet ready for competition or experience a stressful competitive experience they may prefer to just play or give up the game. Some activities involve self competition rather than competing against others e.g. to beat own record, to improve own score. a) Comparison with others – competing. Competition occurs when children compare themselves with others. Children learn to be competitive through constant comparison with others. Sadly those who don't compare well are more likely to give up. Using personal progress to set attainable targets for all children is a way of measuring achievement, which can give a sense of satisfaction and worth, even when they lose, and encourages them all to continue. Participate in a competitive situation where one team may win and the other loses. Experience the emotions of winning and losing. Be encouraged to accept winning with dignity or losing gracefully. Work with their peers as a team. 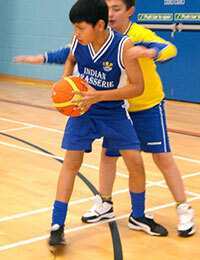 Develop self confidence, enjoy sport and demonstrate their ability. Individually demonstrate their personal achievements. Raise their awareness of other cultures and develop a greater understanding and empathy with children of other cultures. It is essential that children should be coached in these competitive experiences by teachers, leaders and coaches who fully understand the needs of children and are knowledgeable and caring in the craft of coaching. Participants should be taught that winning and losing are merely results of all sporting competitions. There should not be an over emphasis of winning as this can lead to dissatisfaction with sport in general. Competition is a test of ability and potential, with the pursuit of excellence a desirable outcome as in other forms of human endeavour. Participants should be encouraged to achieve, to do their best and to develop their full sporting potential. Challenging competition is only one element of the developing process. The emphasis should be on the quality of the experience and its appropriateness to the age and ability of the participant. All participants should be given opportunities to succeed and do their best through competition. It is possible to help children see competition as chances to succeed by selecting the correct level of competition for them and presenting the competitive experience positively. Organise the competition so teams are not mismatched, emphasising the weaker and stronger. Children are more likely to enjoy the games and stay in the sport longer if they play at a level that they can do well but not too easily. Children that play in teams that constantly lose will probably get fed up. Losing all the time can mean no fun and children will not want to play. Nobody likes to lose all the time. This may mean seeding or ability grouping the teams before they play or even picking up new teams. Where the ability level is unknown prior to the competition keep the games short so that huge differences in score are not recorded. If children think that they can only succeed if they win they will be under more pressure and may find competition stressful. But if they think that they can be successful if they play as well as they can, then they will know that they can be successful even if they lose the match. Playing well is more important than winning. Each competition can be presented as a test of their skills and improvement at that moment in time rather than a final examination. Encourage all children to assess their progress by comparing their performance to their previous efforts of their own performance targets. Reward all children for their efforts and progress they have made. Use different children as examples of good performance. Habitually comparing players with others. Competitions which are unevenly balanced. Organisers of competitions should first give considerable thought to the objectives of the proposed event. Some might argue a case for a competition which concludes with a clear final ranking of the participating teams. However in Mini-Basketball it is more about providing the opportunity for teams to play others of comparable ability with no final ranking publicised. It is more important to just give children the chance to play with and against children from other environments. In this case the organiser may even mix the children up into new teams. The age-grouping i.e. 9 year olds, 11 year olds, or 8 & 9 year olds, 10 & 11 year olds. Children should play in competitions of more than two years age range. Are the age-groupings by school year or calendar year? gender grouping – i.e. boys and girls in mixed teams with or without a set ratio or girls and boys playing in separate teams. Opportunities for the participating children to get to know and enjoy the company from other teams i.e. ice-breakers, other social and sporting activities, mixing at breaks, mixing the teams. The format, length and rules of the games. All competitions should be run adopting the 'Rules of Mini-Basketball' so that the spirit and philosophy of the game is not prejudiced. Some rule modifications may be necessary to suit the format selected e.g. the length of games may be shortened or there may be central timing with a running clock. This only serves as a guide and is intended to show how tactical understanding and game skills can be developed in competitive situations. In an organised competitive event between visiting teams it would be expected that competing teams would have equal numbers in each team. Individual and team development varies according to the players' knowledge, skills and understanding, their opportunities to play and each individual child's maturity. The majority of children who play Mini-Basketball are introduced to the full game at about 10 – 11 years of age at the earliest, but again this can vary according to the local opportunities and the child's maturity. 1. A team can move the ball towards the goal by successfully passing, receiving and dribbling, finishing with a shot at the basket. The team can ATTACK. 2. Players understand their role in the team in achieving a successful attack. They spread out as a team, showing team balance, they move and show their hands to receive a pass, and dribble to advance the ball to penetrate the defence. The team has an understanding of TEAM PLAY. 3. Players run back to mark their assigned player when possession is lost. They understand TRANSITION FROM ATTACK TO DEFENCE. 4. Players mark an individual opponent to score and help a team mate if they lose their opponent in a threatening position. The team can DEFEND. 5. Players try to intercept the ball particularly after a pass, shot or rebound and move quickly ahead to attack the opponent's basket. They understand TRANSITION FROM DEFENCE TO ATTACK. The game shape described is only approximate. Children are still at the learning stage, mistakes will be made and skill will vary from child to child. Children should not be criticised for making errors when they are still learning in the game situation. Once teachers, leaders and coaches are satisfied that the children are ready to play a full game of Mini-Basketball they should practice the game regularly so that it can take shape. Once the game has sufficient shape, the players can be introduced to inter-team competitions at their level of play. Fun – competition should be enjoyable for all teams. Challenge – children can experience both success and failure. Comparison – the team is learning how well they play. Experience – The team is learning to cope with winning and losing. The team learns how to adapt in different situations. Respect – The team learns that coaches, teachers, officials and organisers help us to play, learn the rules and improve our play. Unhappy experiences – children who do not enjoy competition will give up. Bad sportsmanship – poor losers are not coping with failure. Ability differences – mismatches in ability may deter children from continuing to play. Poor behaviour – positive attitudes to players, coaches and officials must be encouraged. An event used particularly in the introductory stages of Mini-Basketball or where an intensive competitive atmosphere at the event is not the objective. The event programme is arranged so that all the teams play an equal number of matches and although the result of each game may be recorded, intentionally no attempt is made to rank the teams. Previous knowledge can be used by the organisers to ensure, where possible teams are matched according to ability. The teams do not play all the teams present thus deterring informal ranking of teams. If the organiser is unable to match the teams according to ability at the start, the teams could be seeded half way through the event programme once their standard is known. 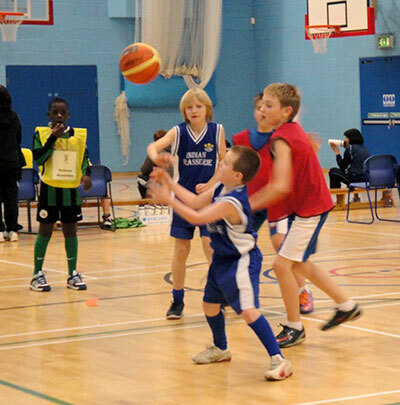 The aim at a Mini-Basketball Festival or Rally is for all the teams to finish with a good feeling about their experiences. Mementoes in the form of badges, medals and/or certificates are presented to all the participants equally. The emphasis is on enjoyment, improvement and good sporting attitudes. MBE recommends this style of event as well as unranked leagues. Several rounds of the competition are organised according to the entry. Winners of the first round progress to the second until the final match is played. The losers of a particular match may be eliminated from the competition or they may be entered into another 'plate' competition at that level. This organisation can be quite complex. Generally such competitions are used as 'cup competitions' with the emphasis on the final winner who receives the rewards of cup and medals. The competition does not usually allow for each team in the competition to play an equal number of games so is not very popular for mini-basketball events. In this style of tournament the teams are divided into equal size groups or pools. In the pool the teams play off in a league basis and are ranked according to their results. This style of tournament can provide a more equal number of games for each team. It also allows teams to experience more success at their level of ability. This is particularly true after the pool games if every team gets to play in a section with teams of similar ability. This is the preferred tournament style in Mini-Basketball when teams are experienced in competition and are able to meet together at a Central Venue with several courts. Momentoes can be given to all participating teams with specific rewards given to pool winners and second round winners. A straightforward league programme can be devised to be played on one day or over a season with league tables recorded. This style of league mirrors the organisation of adult and professional leagues and is generally popular in areas of strong competitive club involvement with teams from Mini to Senior basketball. According to the number of teams entered home and away fixtures can be arranged. Where there are many teams similar ability leagues can be organised with promotion and relegation at the end of the season. Alternatively the leagues can be organised geographically with cross-over games at the end of the season to determine final positions. The successful completion of all fixtures can be affected by the success of the individual teams with 'losing teams' sometimes reluctant to fulfil all their fixtures. Every league game is important for winning teams and coaches can be motivated to achieve high scores in individual games if points scored are taken into account in the final calculation of positions. The competitive style of a league may affect attitudes in the games, increasing the intensity and promote inter club rivalry. Where a development approach is more appropriate for Mini-Basketball in an area the league style can be modified so that teams do not play every other team and as a result no formal league ranking is undertaken. This modified style of 'friendly' league competition is used particularly in an inter –school fixture programme where teachers may prefer an organised approach to fixtures but do not want to impose over-competitive attitudes. Each game can be organised according to the needs of the teams involved with more suitably matched games. Teachers work together to identify teams who are not so strong, mismatches are avoided and because league position is not identified the competitive pressure within each match is also controlled. Teachers must be prepared to commit to this style of league and keep to the commitment of the agreed fixture programme. It has been found through experience that because results are not collated; it is easier to cancel an individual match in this format. Momentoes in an unranked league can be given in the form of participation certificates but as there are no overall winner's cups are not awarded. Other achievements could be highlighted i.e. skill awards, sportsmanship award.